The Government has recently made public the �Draft National Pricing Pharmaceutical Policy, 2011� The circulation of the draft policy, supposedly to make medicines more affordable, comes in a situation where studies show that out-of-pocket medical costs push over 2% of the population below the poverty line in one year. A major part of expenditure on health in India, that people have to meet from their own resources, goes towards buying medicines. This is so because the government spends too little on health care and medicine prices are too high. Unlike in countries with well developed public health systems, where a major proportion of medicines consumed is provided by the public health system, in India around 85% of medicines consumed are bought by patients from chemists shops. 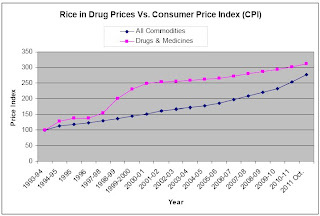 Thus, over time, the prices of an overwhelming majority of medicines in the market have been decontrolled. 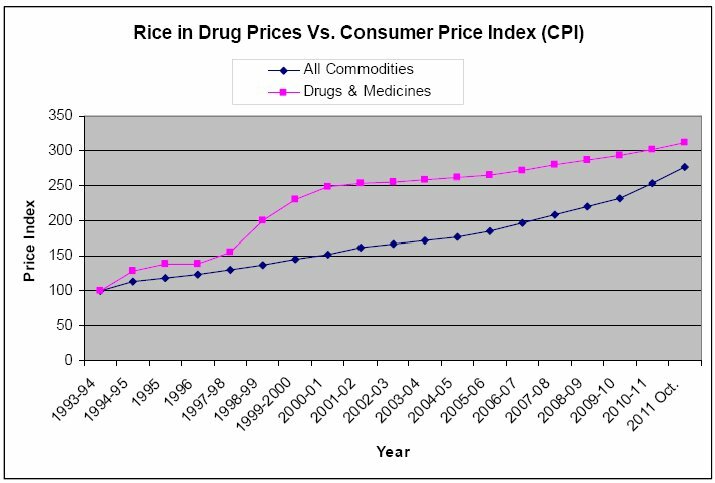 While the Government has continued to reason that such decontrol is necessary for the health of the industry, it has had a serious and continuous impact on drug prices � which have grown exponentially over time (see Chart below). Drug prices have risen in the past decades because of price decontrol and through manipulation of the market by pharmaceutical companies. That the market for medicines is rigged by drug companies is clear from the fact that top-selling brands of medicines are often the most expensive or one of the most expensive. This is clearly not a free market situation where competition helps stabilize prices, but a situation where large companies maintain high prices by bribing doctors and chemists to promote their more expensive medicines even though the same drug is available at 1/5th or 1/10th of the price charged by many top selling brands. �we suspend the operation of the order to the extent it directs that the Policy dated 15.2.2002 shall not be implemented. However we direct that the petitioner shall consider and formulate appropriate criteria for ensuring essential and life saving drugs not to fall out of the price control and further directed to review drugs, which are essential and life saving in nature till 2nd May, 2003�. Since then there have been several calls for the introduction of a fair pharma pricing policy. These calls have also been echoed by the Parliamentary Standing Committee on Health and by the Supreme Court. The Government responded to such calls by constituting several Committees e.g the Sandhu Comitteee and the Pronob Sen Committee. A �Group of Ministers� was constituted during the term of UPA I to effect a fair resolution of the issue. It remains a mystery why the group failed, in seven long years, to find a solution. It is in the above background that the draft Pharma policy, 2011 has to be seen. It has been formulated in a situation when: 1) Most medicines are outside price control; 2) There is complete anarchy as regards prices of medicines outside price control, with clear evidence that the same medicine is being sold at prices that vary enormously. 3) The prices of top selling brands of the same medicine are often the most expensive. The proposed policy starts with a radical and welcome proposal that all drugs (348) in the National Essential Drug List brought be brought under price control. But this proposal hides a much more nefarious design that seeks to legitimize the rampant practice of profiteering in the pharmaceutical market. It does so by proposing that henceforth prices of medicines shall be fixed based on �market based� criteria. Till now, drug prices were fixed by using a �cost plus� formula. The price of the finished product sold in the market was fixed by calculating the cost of manufacturing and then by placing a ceiling on the post manufacturing expense. The post manufacturing expense (MAPE) allowed included the profit for the company � as per the 1995 DPCO it stands at 100%. Thus if the cost to manufacture a formulation is Rs.1.00, it can be sold at Rs.2.00. The new policy makes two significant departures from the existing methodology of calculating the price of a medicines. In its defence the draft policy says that: �The emphasis on price control starting at the bulk drug stage itself has in recent times, resulted in amongst other reasons shifting of manufacture of drugs away from the notified bulk drugs under price control. In fact only 47 bulk drugs out the of the 74 notified in the First Schedule of the DPCO, 1995 are now under production. This has had a cascading effect on the formulations manufactured from the concerned bulk drugs which in turn has affected the availability of such formulations�. This is a patently false argument. First, companies shifted production away from notified bulk drugs, not because the bulk drug price was controlled, but because prices of formulations that could be made from the bulk drug, were controlled. In fact the industry has never clamoured for an upward revision of bulk drug prices. Its emphasis has always been on asking for decontrol of formulation prices. The reason is simple. Bulk drugs are not sold to consumers but to manufacturers of formulatuions. Hence bulk drug prices cannot be manipulated in the market like formulation prices and competition works to keep these prices stable. On the other hand, by unethical promotional practices, formulation prices can be manipulated as these are sold through recommendations by doctors and chemists. The even more blatant manipulation of facts is in evidence when the policy argues for �market based pricing�. The draft policy argues: �The Indian economy is today largely market-driven and, particularly in the area of pricing of manufactured products, prices are determinedby market conditions and market forces. Administered prices exist in a few areas, such as pricing of petroleum products and procurement prices of food-grains but these are closely connected with a regime of subsidies paid by the Government. The Pharmaceutical Industry is a 1 lakh crore industry of which about Rs. 48,200.00 crores is the domestic market�. The cat is finally out of the bag! What is important for the policy is to safeguard the interests of a 1 lakh crore industry, not of lakhs of people who die or are pushed below the poverty line because of high drug prices. It may be pointed out that in many areas like electricity, telephone (both landline and mobile), govt. puts a ceiling on prices. So what is this �market based pricing�? The draft policy says: �The formulation will be priced only by fixing a Ceiling Price (CP)�. The Ceiling Price would be fixed on the basis of Weighted Average Price (WAP) of the top three brands by value�. This constitutes complete capitulation to the interests of the drug industry and complete denial of the rights of poor patients. By fixing the prices of drugs based on the cost of top-selling brands (which often means the most expensive) the government wishes to allow top companies to continue charging exorbitant prices for their medicines. In the case of a life-saving product, one would expect that prices fixed in a price-control regime would be the �floor price�, i.e. the price being charged by least expensive brand. Instead, the new policy, seeks to price drugs at the level charged by the most expensive brands. It is clear, whose interests such a policy will serve.